We were let down at the last minute by a different castle hire company and Let's Bounce stepped in and I am SO pleased. Professional and friendly service from start to finish even on a day when we know they had been so busy at a local festival. The other company had advertised as being cheaper on a Facebook page but actually once we factored everything in including time etc Let's Bounce were the same price. We will be using you again! Dimensions 12 ft x 15 ft x 10 ft tall. Castle/slide combos are a big wow with children. This combo fits in most halls and gardens. Bounce, climb and slide into action with all things hero themed! 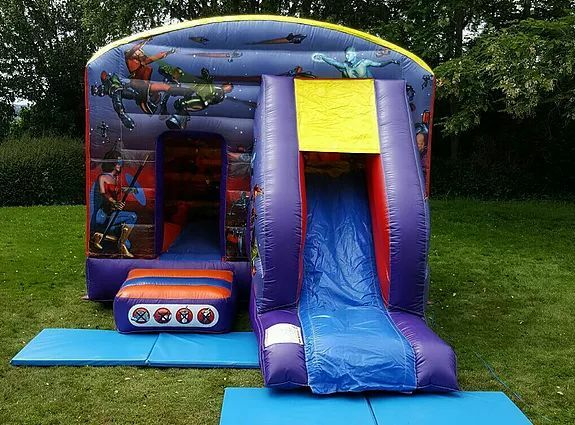 A closed in bounce area with a slide packed with hero and villain fun! Suitable for action heroes up to 1.5m tall.